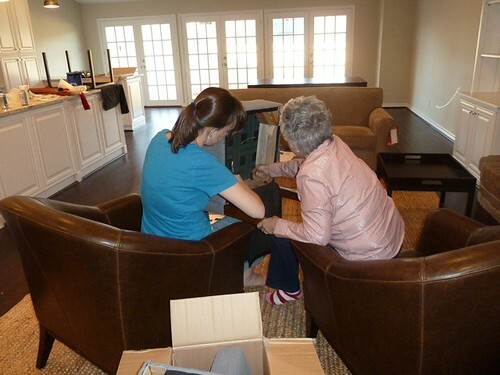 It’s a little hard to type this since my fingers are clenched into claws after assembling at least 5 zillion pieces of furniture yesterday with the much needed help of my mom, my aunt and Jason. They are beyond fabulous and deserve at least 2 ponies each. Yes, I realize that most of these photos are virtually identical. Sorry, we were busy. :) I’m really regretting not getting a picture of our 3-car caravan making the trip around the block to the flip with our tailgates open and boxes and rugs hanging out of the back. Classy, don’t you think? Anyhoo, now I’m going back at it, more later! Delurking to ask where the couch is from! I really love it, and it doesn’t have loose back cushions, and those are really hard to find. World Market! It was on sale and I’m afraid they might have discontinued it since I don’t think I see it on their website anymore – I think it was the Chase sofa? Hmm, hopefully I’m wrong and it’s still around! 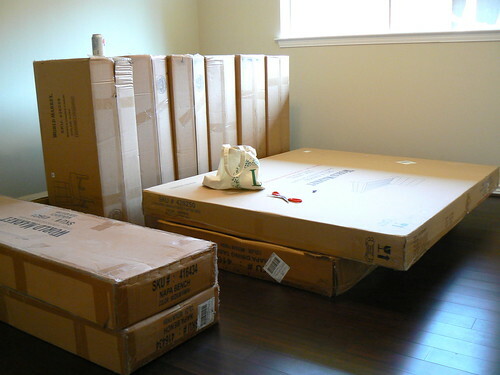 did you BUY all this furniture? is it being sold with the house or keeping it for future projects? Yes! 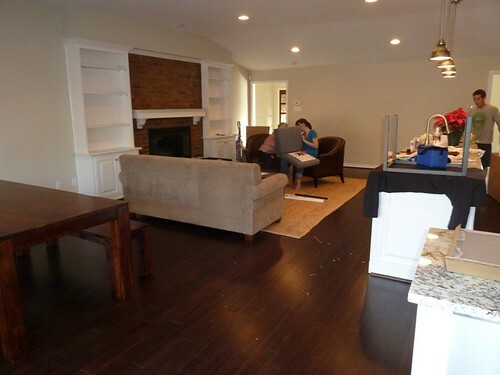 We decided to go for it because we think the house will show better with furniture in a few key rooms (the great room, dining room and master bedroom). If a buyer likes it, they are of course welcome to buy it, otherwise we’ll use it in future flips! Robin´s last blog post post ..Because I love FREE!! awesome awesome awesome! everything is looking so great!! That is so exciting! How nice of your lovely mother and aunt to help out…happy Christmas week! We can’t wait for the first open house! 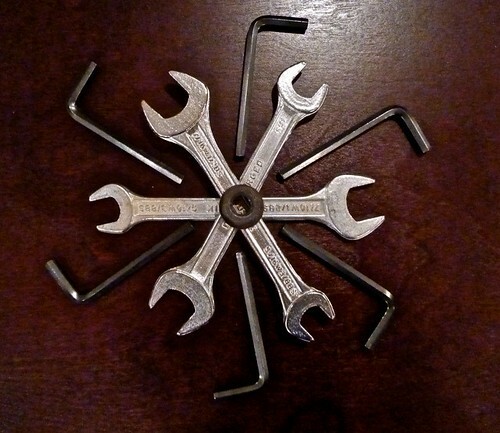 Love the allen/hex wrench design. Truly an inspired construction. Thanks for all the great pictures!!! Now I want to see more of your staging! 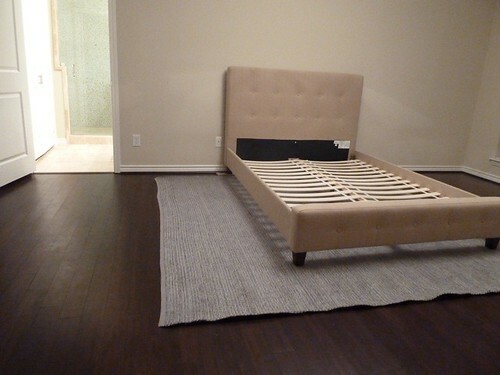 Loving the simplicity of the bed too. Where did that come from? It’s the Draper Upholstered Headboard in Oatmeal from World Market (http://www.worldmarket.com/product/index.jsp?productId=4024574). Keep your eye on it because it goes on sale (we snagged it for a lot less). I love all your flips (viewied from older posts) but it has been incredible to watch this one in real-time. I am patiently waiting for the pictures of what the house looks like staged. Have a wonderful New Year! I am sure 2011 will bring you even more sucess. I’ve been following your flip and just realized when I walked by it with my dog this morning, it is one street over from me! The neighborhood is desperate for updated houses so thanks for doing your part and raising our property values, it looks amazing! Ha, we’re doing our best! :) So cool that you live in the neighborhood, what a small world!